A dedicated teacher known for her love of the “Iduma family” is the Killeen ISD Elementary Teacher Spotlight for the Month. 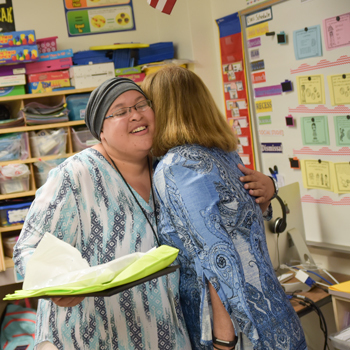 Blasting noisemakers and sirens, school administrators joined human resources and Education Foundation representatives to surprise a teacher worthy of the special honor. 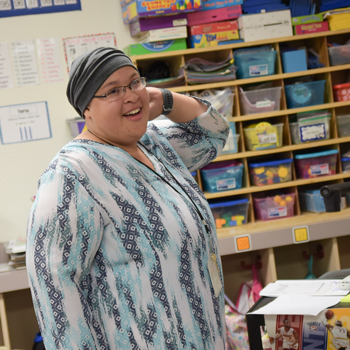 Iduma Elementary School teacher Jessica Lewis was moving around the room, working with her students, when her door swung open and the room filled with staff and the spotlight award crew. Nominator and Principal Katy Bohannon laughed and gave Lewis a hug while the teacher stood in astonishment as the crowd celebrated her. The teacher accepted her goody bag and certificate and hugs were shared. The teacher still couldn’t believe that she had been selected for the honor. A product of Killeen ISD, the popular teacher always knew that she wanted to teach and give back to the school district that gave her so much. The teacher of three years loves sharing experiences with her second-graders. Lewis knows that every student requires different methods of teaching and that can be a difficult hurdle to overcome, but for the teacher, it is well worth the effort. During each unit of inquiry in the Primary Years Program that Iduma uses, Lewis takes the time to weave in lessons about how to be better people to each other. Thanking the Iduma staff, the second-grade team and Bohannon, Lewis said she wants to keep growing as a teacher and to keep her students engaged in their learning.